Johnny Keane made a commitment to the heart of Bob Gibson and the outcome was successful for the Cardinals. 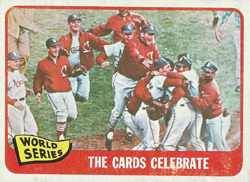 On Oct. 15, 1964, the Yankees and Cardinals played the decisive Game 7 of the World Series at St. Louis. The Cardinals started their ace, Gibson, and led, 7-3, entering the ninth inning. Gibson, 28, had pitched eight innings in Game 2 and 10 innings in Game 5. He also had pitched eight innings in his final start of the regular season on Oct. 2 and four innings of relief in the pennant-clinching season finale on Oct. 4. Keane, the Cardinals’ manager, never wavered in sending out Gibson to pitch the ninth inning of Game 7. The first batter, Tom Tresh, struck out. The next, No. 8 batter Clete Boyer, “jumped on the fastball he knew was coming,” Gibson said, and hit a home run over the left-field wall, making the score, 7-4. Gibson struck out Johnny Blanchard, pinch-hitting for reliever Pete Mikkelsen. With one more out, the Cardinals would be World Series champions. Phil Linz, a shortstop who had hit five home runs during the regular season, batted next and hit a home run over the left-field wall. The score was 7-5. Up next was Bobby Richardson, who had produced 13 hits in this World Series. If Richardson reached base, slugger Roger Maris would follow, then Mickey Mantle. Ray Sadecki, a left-hander who had started Games 1 and 4 of the World Series, was loosening in the bullpen. Keane had decided he would bring in Sadecki to face the left-handed Maris if Richardson got on base. After Gibson worked the count to 1-and-1 on Richardson, Keane went to the mound to talk with his pitcher. Catcher Tim McCarver “did not go all the way out because he knew Gibson hated it when the catcher came out _ and, besides, there was nothing to say,” Halberstam wrote. The next pitch from Gibson was a fastball. Richardson swung and hit a pop-up to second baseman Dal Maxvill, who made the catch. The Cardinals were World Series champions for the first time in 18 years. The Dark Knight can pitch on my team any day.